Quire 20 probably contained 7 normal-sized bifolia, of which the central bifolio is now missing. The remaining folios are numbered 103 through 108 and 111 through 116. The gathering mark is (unusually) on f103r. This gathering contains the complete 'recipes' section. 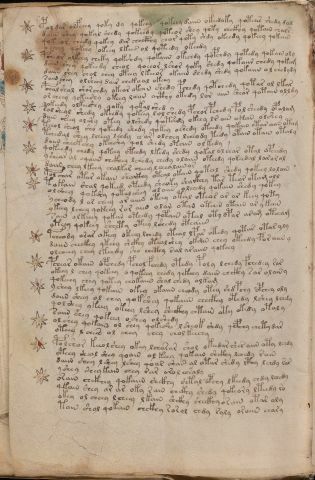 The section owes its name to the fact that it has short paragraphs preceded by a star each, and appear similar to recipes in medical MSs. 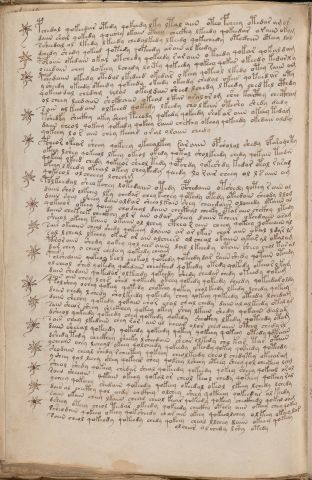 The number of marginal stars is 324, but because (at least) one bifolio is missing, we don't know what would have been the total number. Tiltman analysed the text of this section very intensively, and his conclusions have been summarised in the analysis section. 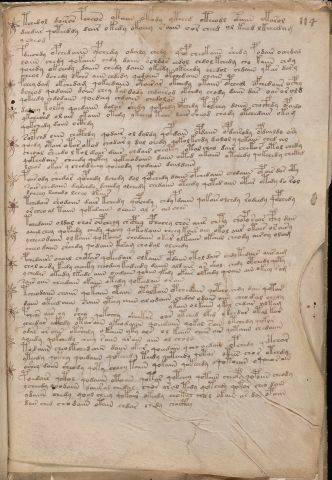 Theodore Petersen, in his hand transcription, transcribed each paragraph on a single line (spanning several pages in width), hoping to find some indication of a similar structure in each paragraph. Normal folio. The folio nr. is on f103r. 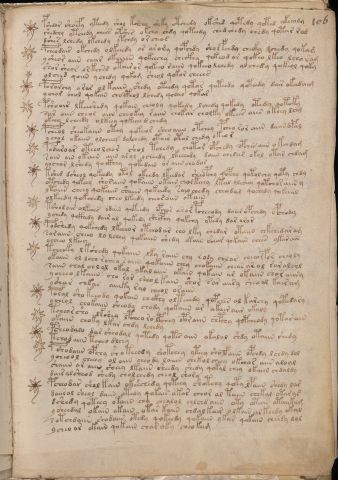 This is a so-called recipes page, which is text-only, with stars drawn in the margin (see also here). Folio nr (103) in upper right corner. Gathering mark "20" in the lower left corner (which is unusual). There are 19 stars in the left margin. They have been painted red, or have a faded yellow circle in the centre, or are entirely unpainted. The last one appears to have a 'tail' at the top. There are 54 lines of text. The number of paragraphs is not entirely certain, but seems to be 18, i.e. one less than the nr. of stars. 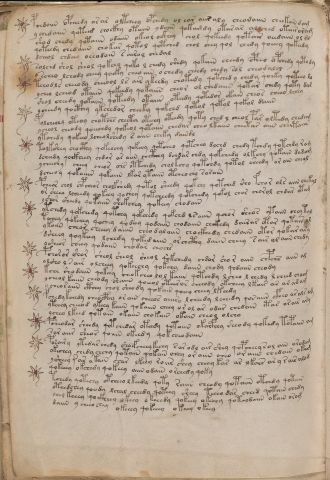 There are 14 stars in the margin. They have alternatingly red or faded yellow circles in the centre. None have tails. There are 46 lines of text, in almost certainly 14 paragraphs. Normal folio. The folio nr. is on f104r. Folio nr (104) in upper right corner. 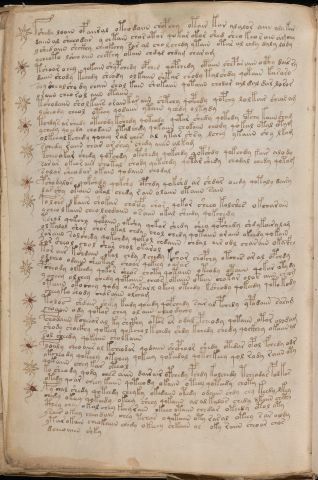 There are 13 stars in the left margin, all with a tail. Some are red, some have a red dot in the centre and others have a faded yellow dot in the centre. There are 45 lines of text in 13 paragraphs. 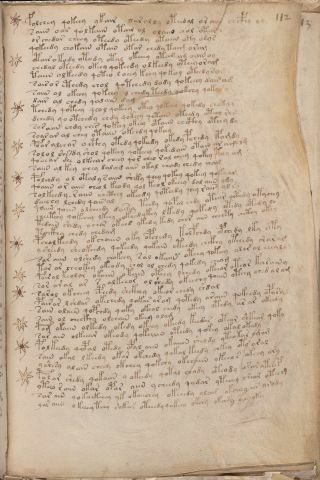 There are 13 stars in the left margin, all with a tail. They alternatingly have a red dot or a faded yellow dot in the centre. There are 44 lines of text in 13 paragraphs. Normal folio. The folio nr. is on f105r. Folio nr (105) in upper right corner. 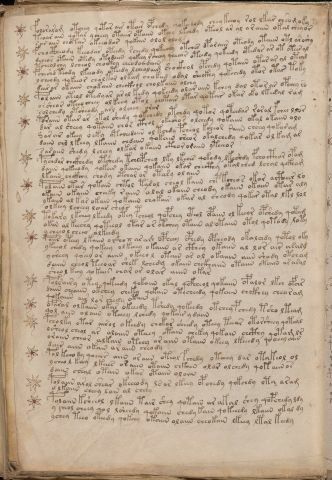 There a ten stars in the left margin, though the first one is drawn above, rather than to the left of the start of the text. They all ave a tail. The centres have a red or faded yellow dot, mostly alternatingly. There are 37 lines of text in ten paragraps. The very last line is centred. There is a break between the third and fourth paragraph, and it appears as if the end of the third paragraphs was written above it. The start of this page looks as if it should or could have been the start of this section. 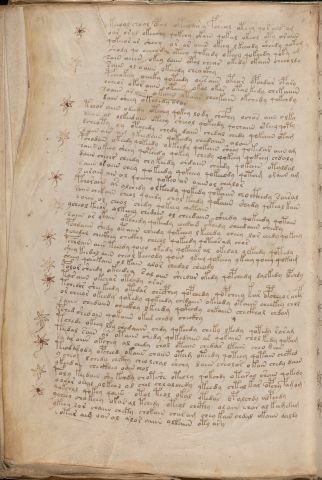 There are 10 stars in the left margin, all with a tail. The centres have alternatingly red and faded yellow dots. There are 38 lines of text in 10 paragraphs. The tenth is longer than usual. Normal folio. The folio nr. is on f106r. Folio nr (106) in upper right corner. 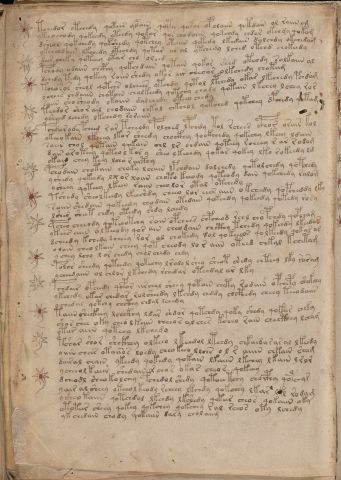 There are 15 large stars and one small one in the left margin. The smaller one is drawn just above and attached to the third large one. All large stars have tails, and coloured dots in their centre, alternatingly red or faded yellow. There are 47 lines of text in 15 paragraphs. The last one is longer than usual. 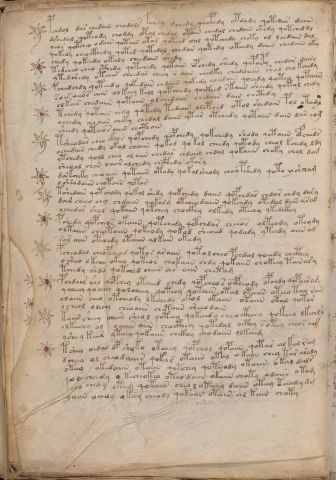 There are 14 stars drawn in the left margin, all with a tail. They have coloured dots in the centre, alternatingly red and faded yellow. There are 47 lines of text in 15 paragraphs, i.e. one more than the number of marginal stars. Normal folio. The folio nr. is on f107r. There is a small round hole near the right margin of the page. Folio nr (107) in upper right corner. There are 15 stars in the left margin, all with a tail. They have coloured dots in their centres which are alternatingly red and faded yellow. There are three dots to the left of the 11th star. It is not clear whether this is original to the MS. There are 51 lines of text in (most probably) 15 paragraphs. There is a small round hole near the left margin of the page. 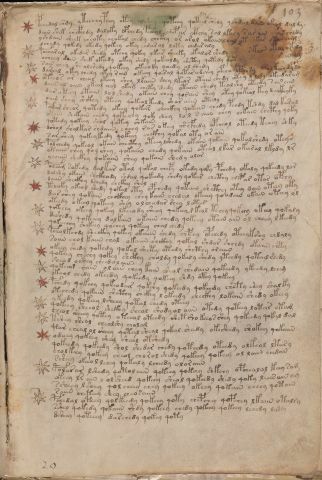 There are 15 stars in the left margin. They all seem to have a tail, but some are short and others very faint. They have coloured dots in the centre, alternatingly red and fadd yellow. The first start has three short vertical lines both left and right of it. There are 49 lines of text in 15 paragraphs. Normal folio. The folio nr. is on f108r. Folio nr (108) in upper right corner. 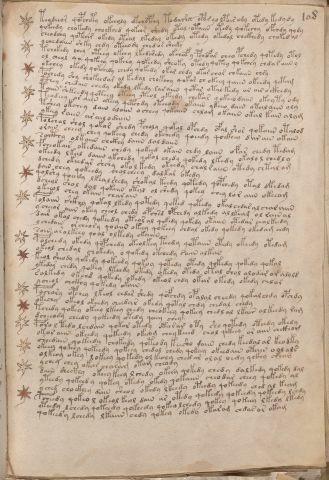 There are 16 stars in the left margin, all with a tail. Some are painted red, others have a yellow faded dot in the middle, and others again are left white. There are 50 lines of text, probably in 16 paragraphs. One or two paragraph breaks are not certain. 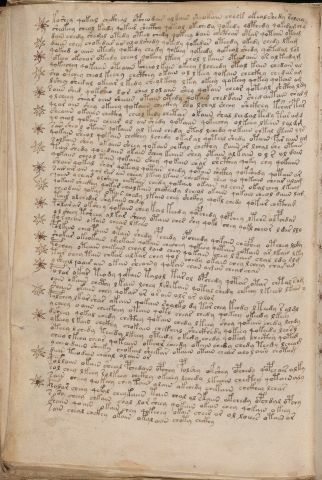 There are 16 stars in the left margin, all with a tail. The first nine alternate with red and faded yellow dots in the centre. The tenth stands out a bit and is a new start with a red dot (as was the ninth). There are 53 lines of text. The number of paragraphs is hard to count, but most probably is only 8, i.e. clearly fewer than the number of stars. The first five are short and aligned with the stars. The sixth and seventh are longer and the eighth appears to cover lines 34 to 53, with the last 7 stars in the margin. Normal folio. The folio nr. is on f111r. Folio nr (111) in upper right corner. There are 17 stars in the left margin, all with a tail. They have coloured dots in the centre, alternatingly red and faded yellow. There are 54 lines of writing, in apparently 6 paragraphs. The first is normal, but the second very long, filling more than half the page. There are 19 stars in the margin. The ninth has a long tail, several have short(er) tails, but most have no tail. They have coloured dots in the centre, alternatingly red and faded yellow. There are 51 lines of text in what looks like 8 paragraphs. The number is hard to count. The first paragraph fills almost half the page. 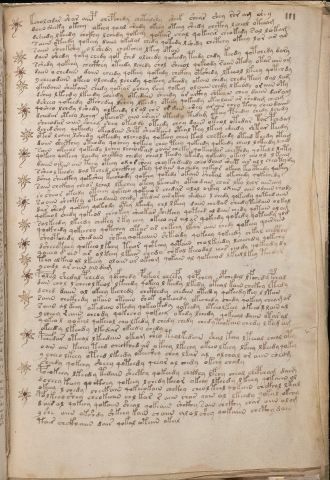 Normal folio. The folio nr. is on f112r. The right edge of the parchment is concave in the upper part, and a large area near it has not been written upon, as if the quality was not good enough. Folio nr (112) in upper right corner. There are 12 stars in the left margin. All have a small tail. They have coloured dots in the centre, alternatingly red and faded yellow. There are 45 lines of text in 11 or 12 paragraphs. The break that should be between the first two cannot really be recognised. The left edge of the parchment is concave in the upper part, and a large area near it has not been written upon, as if the quality was not good enough. 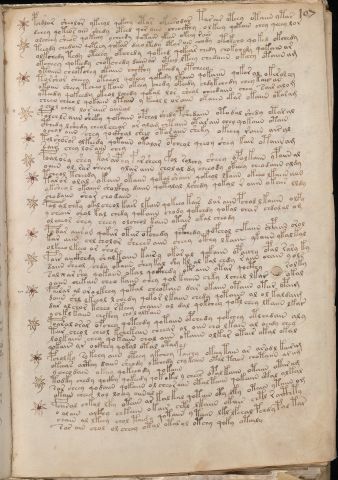 There are 13 stars in the left margin, all with a tail. They have coloured dots in the centre, alternatingly red and faded yellow. There are 47 lines of text in 12 or 13 paragraphs. The break that should be between the last two paragraphs cannot realy be recognised. The first two paragraphs are indented significantly, as if to avoid the patch of bad parchment. The next three paragraphs are also indented, but much less. Normal folio. The folio nr. is on f113r. There are two tiny round holes in the left margin, and a slightly smaller oval one near the right edge of the page. The latter looks like an insect hole. Folio nr (113) in upper right corner. 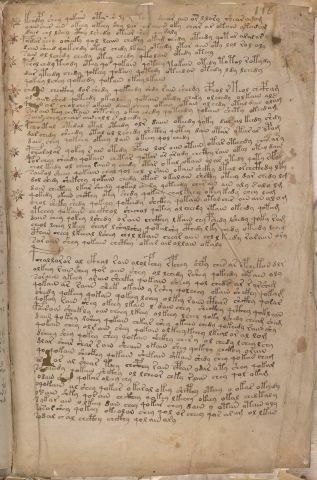 There are 16 stars in the left margin, all with a tail. Their centres have coloured dots, alternatingly red and faded yellow, and unusually starting with faded yellow. There are 51 lines of text in 17 paragraphs, i.e. one more than the number of marginal stars. There are two tiny round holes in the right margin, and a slightly smaller oval one near the left edge of the page. The latter looks like an insect hole. There are 15 stars in the left margin, all with a tail. They have coloured dots in the centre, alternatingly red and faded yellow. Normal folio. The folio nr. is on f114r. 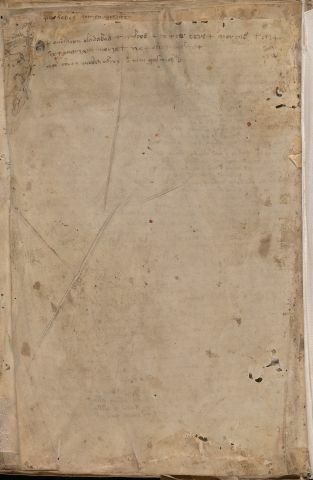 There is a concave part in the edge of the parchment. The number of insect holes is increasing. Folio nr (114) in upper right corner. There are 45 lines of text in 13 paragraphs. The tenth ends with a right-justified partial line. There are 12 stars in the left margin, all with a tail. There are 12 coloured dots in the centre, alternatingly faded yellow and red, unusually starting with faded yellow. There are 41 lines of text in 12 paragraphs. Normal folio. The folio nr. is on f115r. There are numerous insect holes. Folio nr (115) in upper right corner. 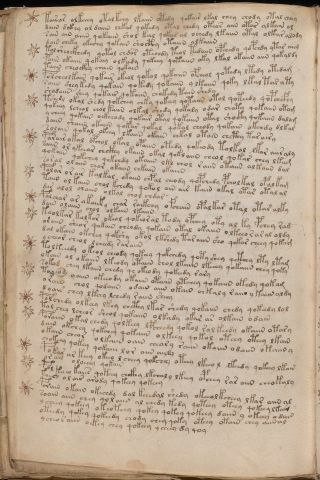 There are 13 stars in the left margin, all except the second one with a tail. They have coloured dots in the centre, alternatingly red and faded yellow. There are 45 lines of text in 13 paragraphs. There is a clear change in ink colour at the end of the fifth paragraph. 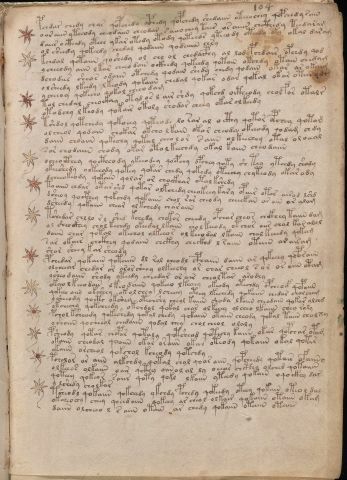 There are 13 stars in the left margin, all with a tail. All ofdd-numbered stars have a red dot in the centre. The others are not painted. Normal folio. The folio nr. is on f116r. There are a large hole and a tear in the upper right corner. The latter was stitched in the past. There are numerous insect holes, also larger ones. Folio nr (116) in upper right corner. 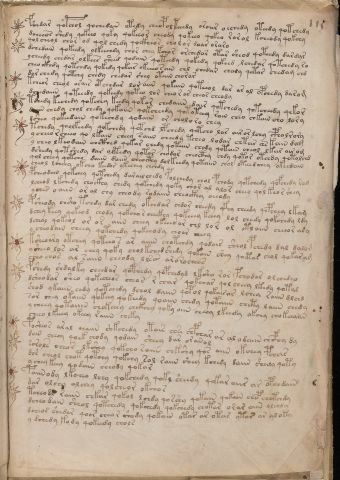 There are 10 stars in the left margin, only in the upper half of the page. These stars do not have tails. Every second star has a red dot in the centre. There are 50 lines of text. 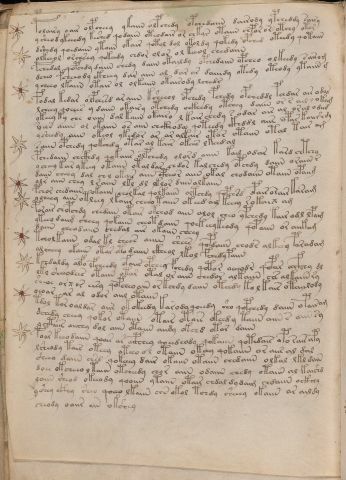 There are 5 short and one long paragraph in the upper half of the page (which has the stars in the margin). The bottom half first has a long paragraph followed by a short one (5 lines). 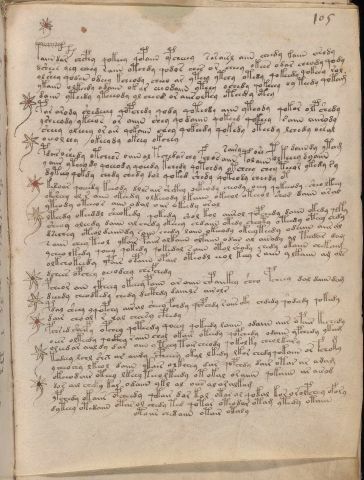 This is the last page of the MS, which follows none of the standard patterns, but has a few lines of text in a mixture of (apparent) Latin, German and writing in the Voynichese script, and some small marginal drawings. These have inspired many researchers, and led to long and so far inconclusive discussions. There are a large hole and a tear in the upper left corner. The latter was stitched in the past. There are stains on this page which are from a previous tanned leather cover. Three small drawings in the left margin. 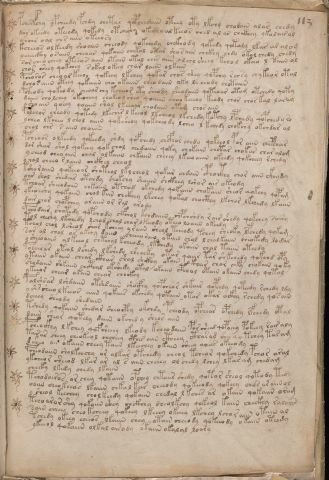 Four lines of writing, the first in the top margin, and the other three in the normal text frame of the rest of the MS. The alphabet used by the writer seems very similar to the one presented in the following IMAGE: 15th Century German alphabet table.